Have you seen some signs that your property may need a water main replacement, such as a damp basement, soggy lawn, or even water seeping through cracks in the foundation surrounding your house? Perhaps you are nervous because you’ve heard about the mess a water main replacement makes, and you don’t want to go through the hassle, or the added expense. If you have these concerns, then you’ve found the right plumbing company to discuss your plumbing with. Have you heard of a trenchless water main replacement? A trenchless water main pull requires zero—NO—digging in your yard. So guess what this means?! Your front lawn will remain in-tact, no mess. This is a huge bonus for going trenchless, and also saves you money – seriously! No digging required – your front yard remains in-tact. JJ’s Plumbing will only dig around the city shut off, at approximately 3-5 feet near the location. Cost savings – less expensive compared to digging to replace the water main. 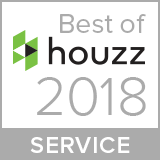 Time savings – JJ’s Plumbing experts not only do the job right, but remain on schedule and aim to get your property back to normal as quickly as possible. Don’t wait to book your water main replacement. Delaying the process may only make the situation worsen, and possibly cause unrepairable damage and increased cost for your home. Our plumbers are licensed and fully certified, not to mention our customer service is second to none. We’re here to discuss the service together and answer any questions or concerns you may have. Currently, trenchless water main replacements are on special. Be sure to fill out the online form on our Coupons web page. Need to Replace Your Water Main? Go Trenchless! A damaged or broken water main is a problem that you have heard about. Your house is older, and you wonder if your property could be at risk. Perhaps you’ve noticed that your lawn is more wet and mushy than normal, your basement seems to be damper, or you’ve noticed water seeping through cracks in the concrete/foundation surrounding your home. These are all signs that may be telling you that your water main is damaged, and it’s time for a replacement before things get much worse, and therefore, more expensive and challenging to fix. If you think you’re in need of a water main replacement, but are concerned about the time it takes, the mess it makes, and how much it’s going to cost, then the JJ’s Plumbing experts are who you should get in touch with. We provide and recommend trenchless water main pulls. Our plumbers are licensed and fully certified, not to mention our customer service is second to none. We’re here to talk through the situation together and answer any questions you have about the process before getting started. A trenchless water main pull requires zero—NO—digging, which means your front lawn will remain in-tact. This is a huge bonus for going trenchless, and also saves you money. Not to mention, for a limited time we are offering $100 off the service. No digging required – your front yard will stay in-tact. Still not quite sure about the process? See our diagram on how a trenchless water main pull works. 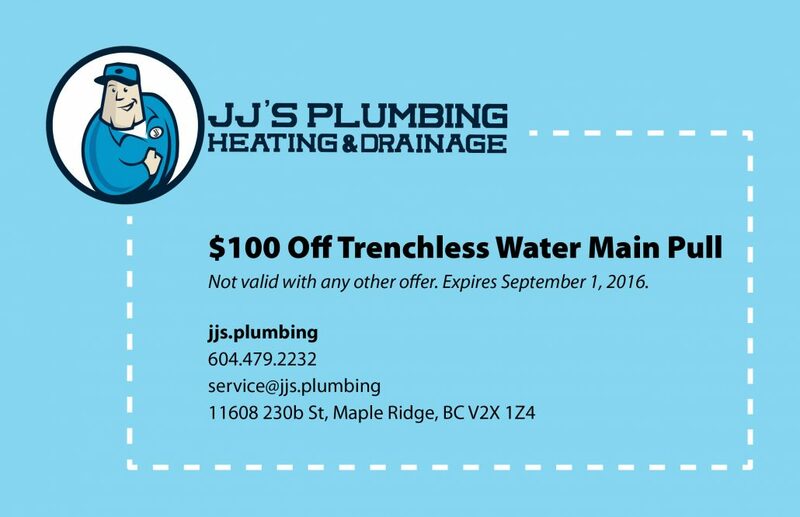 We have a special on now for $100 off a trenchless water main pull. Get your coupon and book today! https://jjs.plumbing/wp-content/uploads/2016/07/Trenchless-Water-Main-Pull-featured-image.jpg 450 1200 Janet Stolth https://jjs.plumbing/wp-content/uploads/2017/12/JJs-Plumbing-logo-with-tag.png Janet Stolth2017-07-26 17:53:182017-10-10 19:19:23Need to Replace Your Water Main? Go Trenchless! So you’ve heard that replacing your water main is something you should consider, you may have seen some signs that it should be done, but you aren’t quite sure, you don’t know how it works, and you don’t know where to start. Well, start with us and a trenchless water main replacement! 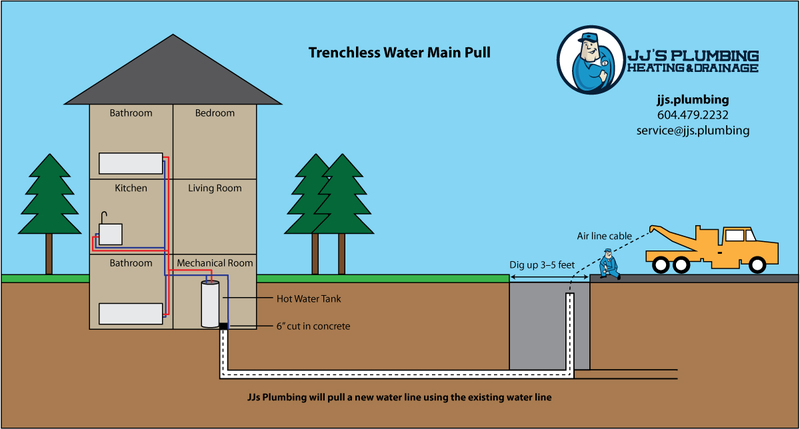 Here are “need-to-knows” on replacing your water main, and how JJ’s Plumbing takes care of the job. First off, why replace your water main? Your water main may use polybutyelene piping. If this is true, you will want to replace your water main before anything happens. Polybutyelene is a type of plastic resin that was used in water supply piping between the late 70s and mid-90s. If your house was built during this time, chances are, you have polybutyelene piping. So why repair it? Oxidants in water supplies, like chlorine, react with polybutyelene piping, which can cause them to flake and become weak/brittle. The result can be thin cracks in the piping, which reduce the strength of the water main. The piping system can end up failing without any warning, leading to flooding and damage to your household and property. Another reason for replacing your water main is a burst or leak in the water line. It is best to replace the whole line, versus patching it. There is water leaking into your basement. Contact JJ’s Plumbing immediately, or call the city so the water can be turned off from the city shut off. So… how does the process work? When the quote is accepted, we will book your appointment and make another visit to take care of business! Finally, we will backfill the hole we created near the city shut off. There is minimal mess near your property with our trenchless water main pull! For a limited time, we’re offering $100 off your water main replacement service! Book for your free quote today. Has your front lawn turned into a swamp? Have you experienced a loss of water pressure? This may mean that your home is in need of a water main replacement. We know what you’re thinking… that the plumbing monsters are starting to lurk around your home and are going to make a massive mess of your landscaping. Homeowners are often afraid of having water main replacement done for this exact reason. Don’t fret! This is where JJ’s Plumbing comes in: We are the experts in plumbing monster hunters, and are here to ensure that your main water line replacement doesn’t make a monster mess of your home and yard. You may be envisioning the inconvenience, cost, and time it will take to dig up the pipe, and replace it or fix the area that is causing the problem. But here’s the thing, it doesn’t have to be done that way. We understand that people don’t want their landscaping to be ripped apart and their home to look like a monster disaster. So, what to do? The solution (because there is always a solution): Main water line replacement with trenchless technology. Upholds your landscaping, driveway, patio, lawn, etc. Saves time and therefore cost. For more technical information, and to answer any questions you may have, contact us, and we’ll be happy to guide you through the process. You don’t need to drastically let the monsters take over your property, turning it into a construction zone. Let us help and get in touch with JJ’s Plumbing today.